Well-made, and with great battery life, the SoundMagic E10BTs are a solidly designed pair of budget wireless in-ear headphones. Their sound quality can feel a little compressed, and the battery pack is a little bulky, but at this price point these are acceptable compromises for a generally pretty good pair of headphones. When it comes to in-ear headphones, a product category so often filled with cheaply-made and even cheaper-sounding products, SoundMagic has been a reassuring presence. The company’s E10s have established themselves as the go-to earbuds at their price point, with a great sound packed into a solid-feeling and simply-designed metal housing. Now the company is taking its E10s wireless, and the result is the SoundMagic E10BTs, a pair of earbuds that come very close to doing for Bluetooth what the original E10s did for wired headphones. They might not be as affordable as their wired brothers, nor as sleek as some of their competitors, but if you want a cheap pair of wireless buds the SoundMagic E10BTs are a well-designed, functional pair. The SoundMagic E10BT headphones maintain the wired versions' wonderfully simple design aesthetic, albeit with one somewhat annoying difference. The buds themselves are a simple cyclindrical design, of plastic construction. It’s a step down from the metal construction of the wired E10s, but we were happy with how solid these buds felt. There are no extra bits of plastic to keep them in your ears during a workout, however, so these might not make the best pair of exercise headphones. On the right-side cable is the set’s in-line remote, but be warned – the way it works is a little unconventional. Instead of combining a set of volume controls with a single button that handles all playback controls, the SoundMagic E10BT remote uses both volume controls to skip forward and backward through tracks. So when you want to skip a track you’ll hold the ‘volume up’ button for a couple of seconds, rather than double-tapping the middle button as on other headphones. We were initially sceptical – ‘Surely you’ll end up accidentally raising the volume whenever you want to skip a track?’ we mused – but in practice the control method works exceptionally well – maybe even better than having people tap a small button up to three times just to restart a track. Pairing is quick and painless. Holding the middle button for a couple of seconds both turns the E10BTs on and puts them in pairing mode the first time you use them, and we found they were more than capable of automatically pairing with our phone when we turned them on subsequently. But the E10BTs form-factor isn’t perfect. Finding a place to stash a battery in a pair of wireless in-ears is never an easy task; some, like the PowerBeats 3s, opt to make the earbuds themselves bigger to contain a battery each, while others, like the BeatsX headphones, have the battery attached to the wire like an extra in-line remote. The SoundMagic E10BTs are more similar to the BeatsXs in this regard, but their battery pack is much more conspicuous. SoundMagic has tried to make the best of a bad situation by adding a clip to the battery pack, along with instructions telling you to attach it to the back of your shirt, but this never felt necessary or convenient. It’s not the worst battery pack in the world, but it’s a minor inconvenience, and something that other manufacturers have implemented more neatly. The sound quality of the SoundMagic E10BT earbuds is good, but not exceptional. Bass is tight and present, without undue heft, and should please all but the most ardent of bass-oholics. Tumbleweave by Black Moth had drive and rhythm to its drum beat, and overall it's one of the more impressive elements of the headphones’ sound. The rest of the mix didn’t have quite as much detail as we would have liked, though, giving an almost cloudy quality to its sound. It’s not that the mids and highs are lost in the mix, but their definition isn’t quite all there. It’s especially apparent in noisier guitar tracks like Go With the Flow by Queens of the Stone Age or Left for Dead by Ghost of a Thousand. Whereas the wired version of these headphones, the SoundMagic E10s, punch well above their weight with their sound quality, the E10BT buds sound much more like a budget pair. With a budget price tag to match that’s not a particularly bad thing, but it does mean these aren’t quite the bargain we’d hoped they might be. Battery life is thankfully solid, perhaps as a result of the slightly oversized battery pack – we got a week’s worth of commuting listening out of these headphones. Large battery pack excluded, the look and feel of these headphones doesn’t betray their budget price point. 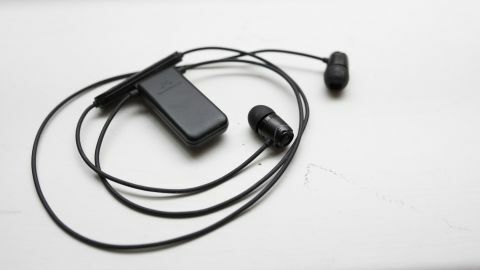 The earbuds themselves are nice and solid, and the in-line remote is well-designed, if slightly different from the norm. Battery life is good, and we were happy with how easily the headphones automatically paired with our phone. The battery pack is big and bulky – we wish it could have been made slightly smaller. Sound quality is acceptable, but not exceptional, and the audio quality can seem a little cloudy and compressed. The SoundMagic E10BT headphones are a great pair of earbuds for anyone who wants to go wireless but doesn’t want to spend too much money in the process. They’re an uncomplicated pair of headphones. You’ve got a couple of simply-designed earbuds connected to a well-made inline remote; there’s nothing fancy here, no fitness-focussed wings to keep the earbuds in your ears, and no fancy W1 chip like we saw in the recently-released BeatsX headphones. It’s only their bulky battery pack and average sound quality – acceptable compromises at this budget price point – that prevent us from wholeheartedly recommending the SoundMagic E10BTs. And if those sound like compromises worth making then you could do a lot worse for the money.